The League of Most Interesting Gentlemen, LLC (the League) is a group of four Gentlemen with a deep interest in the history of our Nation, particularly the period spanning approximately 1750 to 1850. The 21st Century members of the League came together in 2014 to discuss making the founding of our nation and their times live for today's audience. 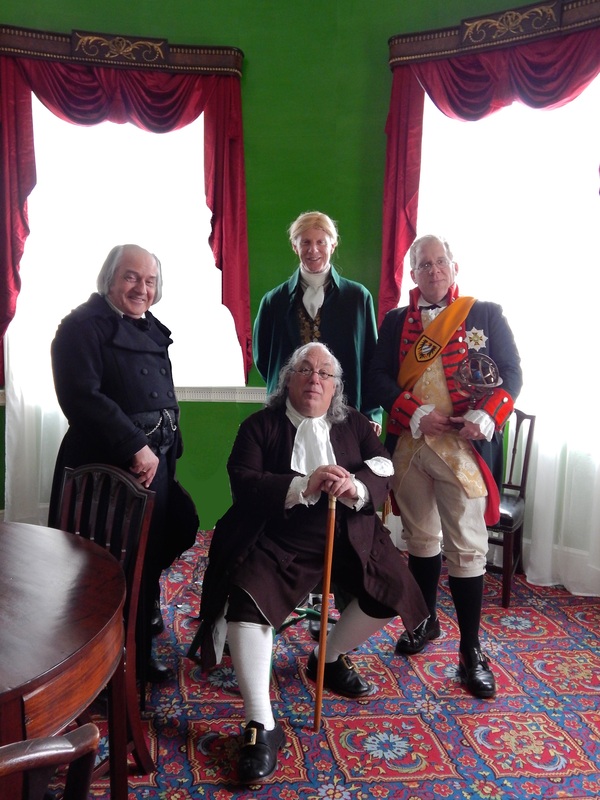 These four founding members present interactive first person interpretations of President Thomas Jefferson; Dr. Benjamin Franklin, statesman and scientist; the Fourth Secretary of the Treasury and diplomat, Albert Gallatin; and a Natural Philosopher (a multifaceted person and educator in the sciences). The members appear in various groupings as well as individuals. They are also joined when appropriate by like minded colleagues and friends. Thomas Jefferson, the “American Sphinx”, as he has been called, enlightens 21st century Americans with his potent words to explain the motives for our forefathers to fight for a government based upon reason rather than force, a novel concept. At the same time he fails to “first take the log out of [his] own eye” because slaves are forced to serve this new country he helped to form. Question him. 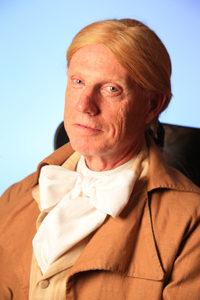 Long an aficionado of Revolutionary Era history, Tom Pitz has been performing as Mr. Jefferson since 1987. He considers it an honor and a privilege to bring one of America’s greatest historical figures back to life for audiences. His performance sites include Michie Tavern, Denver Museum of Natural Science, the College of William and Mary, Keswick Hall, the United States Treasury, University of Virginia, Virginia Genealogical Society, Hampden Sydney College, Carthage College, and the National Geographic Society. As a graduate of Mr. Jefferson’s University, he is well aware that John Adams’ dying statement, “Jefferson Lives” is as true today as it was on July 4th, 1826. The elder statesman, Dr. Benjamin Franklin, is known to all, has seen it all, and done much of it himself. His wit and wisdom captures the hearts and minds of 21st century audiences as it did in the 18th century salons of Paris. 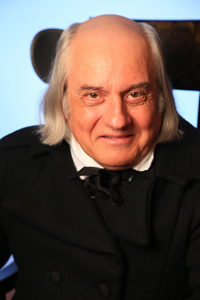 Barry Stevens has been presenting Benjamin Franklin since 2005. Prior to this he participated as a Revolutionary War soldier with the First Virginia Regiment. His education on the life and times of Dr. Franklin has led him to read and travel extensively to locations throughout the Colonies and even to Paris, France. His audiences have been found in Michie Tavern, The Treasury Executive Institute, The National Fire Heritage Center, The City Tavern in Philadelphia, The National Institutes of Health, Proprietary House in Perth Amboy, NJ, The National Science and Engineering Festival and a variety of schools and business conventions. Money may be of interest to some of your visitors or members. No one in American history knew more about that, and the influence it had on government, than Alexander Hamilton and Albert Gallatin. The former is known to all, if for no other reason than he was shot and killed by a Vice President of the United States, and therefore is unavailable to The League. The less well known Mr. Gallatin, however, should be introduced to all Americans today; and The League is happy to oblige. He knows more about the issues of an expanding nation and its government, indebtedness, and republican values than any caucus of 21st century politicians. Ron Duquette (MAJ, USA, Ret.) 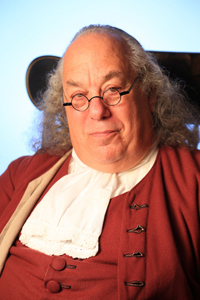 has portrayed Albert Gallatin for nearly 6 years. Ron is fluent in French and, during his Army duties in Europe, acted as a deputy liaison officer to the French Forces in Germany (FFA) in Baden-Baden, Germany. He has appeared at the Swiss Embassy, the State Department, the Museum of the Rockies, NYU's Gallatin School of Individualized Studies, and established the Annual Gallatin Project programming at Friendship Hill. Can you locate your longitude and latitude without your smart phone or computer? Can you hold a mammoth tooth in your hand or cast a hypnotic spell on someone? Alexander Ellicott, Count Rumford, and Dr. Franz Mesmer can. They would be happy to teach children about the science of the Enlightenment so that their elders, who wish to appear too sophisticated to reveal their genuine curiosity, can also learn. The role of the Natural Philosopher in the Age of Enlightenment (seventeenth, eighteenth and early nineteenth centuries) was a combination of the roles played by today's scientists, educators, and philosophers. Dean Howarth is a veteran science teacher and living history instructor, who specializes in interpretations based on the Sciences. He has portrayed dozens of scientific personae, such as Isaac Newton, Count Rumford, William Herschel, David Rittenhouse, Ebenezer Kinnersley, Alessandro Volta, and Franz Anton Mesmer. Presentations on early physics, astronomy, natural science, paleontology, electricity, chemistry and medical quackery are accompanied by his extensive collection of replica instruments. 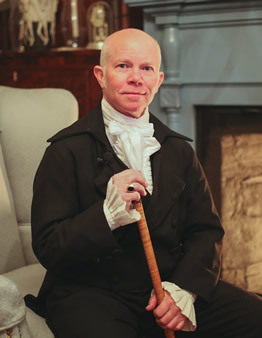 Mr. Howarth has appeared at Gadsby’s Tavern, Mount Vernon, Montpelier, Rippon Lodge, Stabler-Leadbeater Apothecary, Wren Hall, Rumford House (MA), Priestly House (PA), Carlyle House, The White House, Sully Plantation, Claude Moore Colonial Farm, St. Mary City (MD), Wye Oak Church (MD), Arlington Planetarium, and the Smithsonian Institution. The fourth president of the United States, James Madison, is portrayed by our colleague, Kyle Jenks. Mr. Madison is often called the Father of the Constitution, and was also instrumental in drafting the Bill of Rights. Prior to becoming President, James Madison was the Secretary of State for his friend,Thomas Jefferson. In that capacity, he supervised the Louisiana Purchase with the able financial guidance of the Honorable Albert Gallatin. He is also known as one of the collaborators in the writing of the "Federalist Papers". These documents were circulated only in New York in support of the ratification of the new Constitution. They were co-authored with Alexander Hamilton and John Jay in 1788. During his Presidency, Mr. Madison ably dealt with the administrative woes attendant on the War of 1812 and the agreements reached during the negotiation of the Treaty of Ghent, negotiated by Mr. Gallatin, in the closing months of 1814. 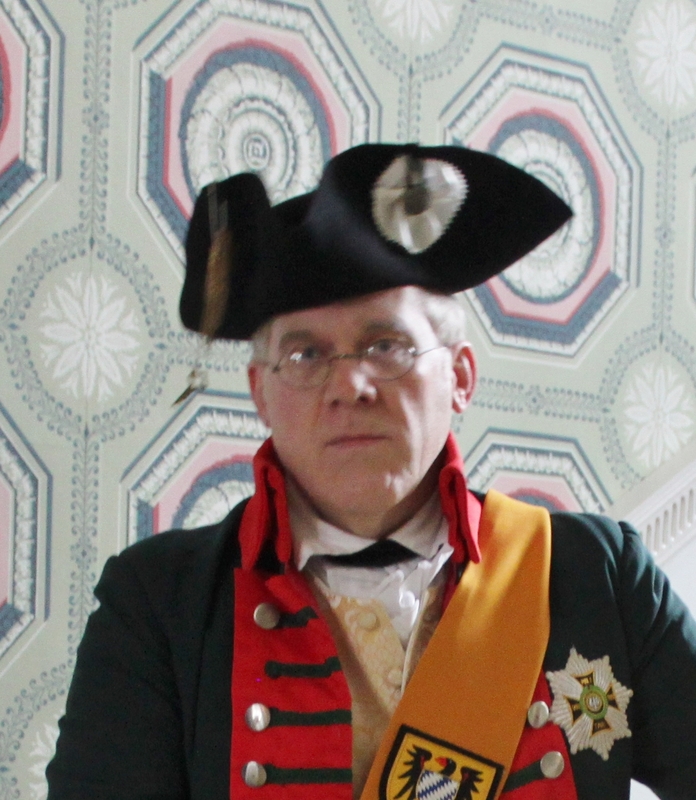 Mr. Jenks, agent for the Fourth President, entered into historical interpretation as a reenactor of individuals in the French and Indian War and American Revolution. From that experience he developed and interprets a researched 18th century composite character, Douglas McKenna in connection with a number of historic interpretation activities. To round out his 18th century historic interpretation he portrays various roles on both sides of the War of Independence.